The average price for this game since released is $24.48. The game first became 50% off on Jul 6, 2012 at Green Man Gaming. Lowest historic price was $5.99 on Feb 20, 2018 at Origin. Need to brush up on your Battlefield 3 skills before the Oct 29 BF4 release? On PC, the Premium Service upgrade is only $11.25, lowest we've seen since May. Great time to upgrade your base game BF3 up to Premium with the Premium Serivce Pack. GMG is running a 50% off instant discount and today they released a 20% off coupon that stacks dropping the price to $12. With the late October BF4 impending release, you might find it worthwhile to brush up on some Battlefield skills. Time to dust off ye old Battlefield 3 copy and brush up before the big October BF4 release? The Battlefield 3 Premium Service upgrade dropped to $12 today at GameFly after a solid 50% instant discount and 20% off coupon code. Lowest price seen since May of this year. Deal is live for 24 hours only. Premium service is at $15, on sale at Origin during its Gamescom sale (ends Aug 27 next week). Perfect if you got in on the Humble Origin Bundle - which almost everyone and their mom got in on. Looks like deal is dead that's all. The average price for this game since released is $27.92. The game first became 50% off on Nov 24, 2012 at Best Buy. Lowest historic price was $7.99 on Jun 4, 2015 at Best Buy. BF3 Premium Edition returns to $8 again at Best Buy. This is the physical PC DVD version (of which contains an Origin key). Population is still decent these days (though if you don't see anyone, turn off DLC to play with those that have base game only). Battlefield 3 Premium is still a $39.99 download on Origin despite its 2012 release date. Right now NewEgg is selling this full game + all expansions for only $9.99 after coupon. It's a physical copy of the game, but shipping is free. I can only get it down to $30. Planning on grabbing a copy of the Oct 29th Battlefield 4 release? If you need to brush up on your BF3 skills, Green Man Gaming has a sale on all things Battlefield 3 on PC. After a 50% instant savings and stacking 25% off coupon code the Premium Edition is only $15 - the lowest price ever. Premium edition of BF3 is now at the lowest ever price thanks to Gamefly's Origin sale which last until end of the week. This gets you the base game + all the expansion packs and DLCs, giving you a complete BF3 experience. The average price for this game since released is $40.79. The game first became 50% off on Nov 24, 2011 at Best Buy. Lowest historic price was $0.83 on Nov 8, 2017 at GameStop. BF3 for the PS3, 360 and PC (along with download version) are all on sale with Origin/EA's massive memorial day weekend sale. At $29.99, its not the lowest ever but it sure beats usual price. Missed out on all the recent Battlefield 3 pre-order deals because you've been living under a rock? No problem, our controversial super-mega-duper-retail store pal Walmart has your back. Get PS3 or Xbox 360 version of BF for $60 and get a $20 eGift card from Walmart, good towards any other purchase (maybe Skyrim? SWTOR? Uncharted 3?). About time...Amazon just threw in a $20 bonus credit when you order Battlefield 3 for PS3 or 360 from them. You also get an Amazon-exclusive "Dog Tag Pack" in addition to the Back to Karkand expansion. This game releases on Tuesday, October 25th. Some blast from the past action? Battlefield 3 is now free for the month on the Xbox 360. Yep, we don't track 360 games anymore but this title works ont he Xbox One. If you've never tried BF3, the single player campaign is worth a few clicks in our opinion. The average price for this game since released is $39.97. The game first became 50% off on Nov 24, 2011 at Best Buy. Lowest historic price was $2.99 on Nov 15, 2014 at GameStop. New lowest price on this "oldie" but goodie. Used copies of BF3 is only $3 at GameStop (previous low for a used copy was around $9 from a Gamefly sale). If you never played the game and just want to romp thru the single player, this isn't a bad deal. Best Buy has a new low on Battlefield 3 for Xbox 360 and PS3. Twenty bucks beats the previous low of $30 last seen Cyber Monday. Cheapest we've seen it in 2012 until now was $40. Battlefield 3 back to $40 at NewEgg. Next best price online is Amazon for $51. Battlefield 3 Limited Edition for Xbox 360 and PS3 is $49.99 through Sunday at Newegg. This is the cheapest the game's been since its official release date. The average price for this game since released is $19.63. The game first became 50% off on Mar 12, 2012 at Origin. Lowest historic price was $0.99 on Dec 23, 2014 at Origin. Can't go wrong with 99 cents Battlefield 3. If you didn't grab it when it was free for a very limited time, now you can get one of the top FPS games for only a buck via Origin's Year End sale. One of the better freebies you'll find out there. The Battlefield 3 PC Download is FREE this week at Origin. Offer expires June 3rd. BF3 shows up for only $4 at GamersGate. Need to add to your library for the sake of completeness? Here's your chance. If you haven't played Battlefield 3 yet, you might as well take advantage of this great deal. Right now you can grab this game for $4, plus there's a coupon code out for an extra 20% off. New lowest price ever. Its five bucks for BF3. Never have the game? Don't want to hop on the BF4 bandwagon before trying the 3rd installment? Now you can add it to your collection for the lowest price ever. http://store.origin.com/store/ea/en_US/pd/productID.249982800 for the stand-alone premium pack for $15. The average price for this game since released is $42.10. The game first became 50% off on May 25, 2012 at Origin. Lowest historic price was $3.99 on Jun 4, 2015 at Best Buy. Now when you Pre-order Battlefield 3 from Origin (new EA Store) you get the Back to Karkand Expansion Pack and Dead Space 2 (PC Download) all for only $59.99. Dead Space 2 is normally $20 for PC download and Battlefield 3 Pre-order's usually range from $54-$60 for download --you save $20 when you get the two games bundled together. Another cool thing about pre-ordering from Origin is you can preload your game before it launches so that you can play the EXACT minute Battlefield 3 releases instead of having to wait forever for the game to install. After all the pre-order bonus drama, Battlefield 3 is now available for pre-order at Newegg for $10 for all platforms (Xbox, PS3). Solid deal for Battlefield fans. The average price for this game since released is $19.99. The game first became 50% off on Jan 29, 2013 at Amazon. Lowest historic price was $7.50 on Oct 11, 2013 at Green Man Gaming. Sick of getting romped by experienced players on Battlefield 3? Now you can get the Shortcut Bundle for only ten bucks. 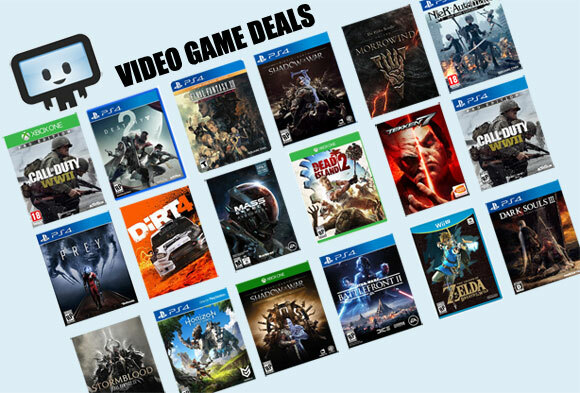 GMG marked it 75% off the usual $40 list price. Unlocks weapons and gear that otherwise require having no life to achieve through hours of gameplay. How do you kill that which has no life? Battlefield 3 was released October 25, 2011 for Microsoft Windows, XBox 360, and PlayStation 3. This first-person shooting game is the eleventh of the Battlefield series and a direct followup to Battlefield 2. Pre-Orders for Battlefield 3 - Limited Edition from Amazon included the Battlefield 3: Back to Karkand expansion pack for free. The expansion includes four legendary maps from Battlefield 2 boldly re-imagined in the Frostbite 2 engine, as well as Battlefield 2 weapons, vehicles, and unique rewards. 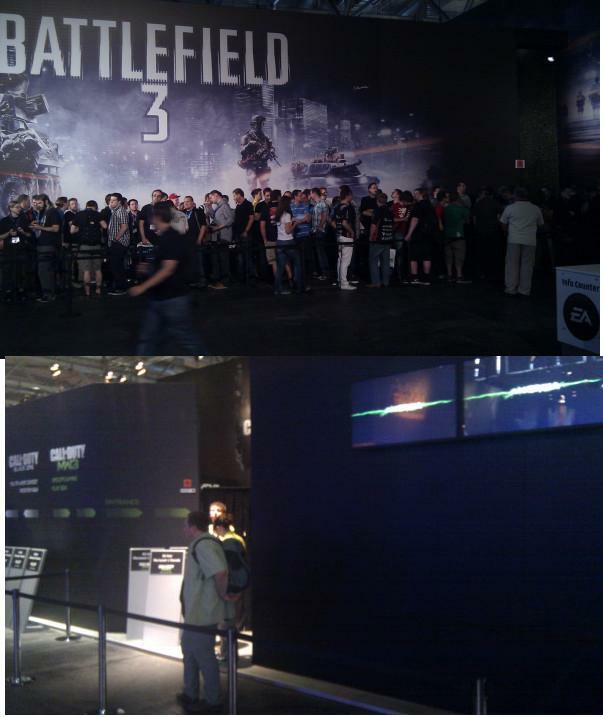 Side note: BF3 vs MW3. Okay this picture at Gamescon is probably out of context but still hilarious.